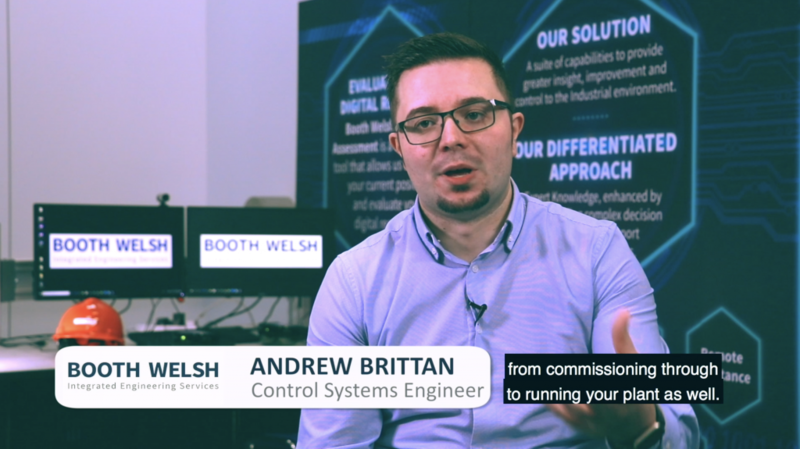 Booth Welsh contacted us looking for a video to support them in marketing their new digitalisation product. The product was complex so a video, which could show the product in action, was the perfect solution to help their marketing team. They planned to share the video at trade shows, via email, and on social media to provide a jumping off point for further discussion with interested clients and partners. 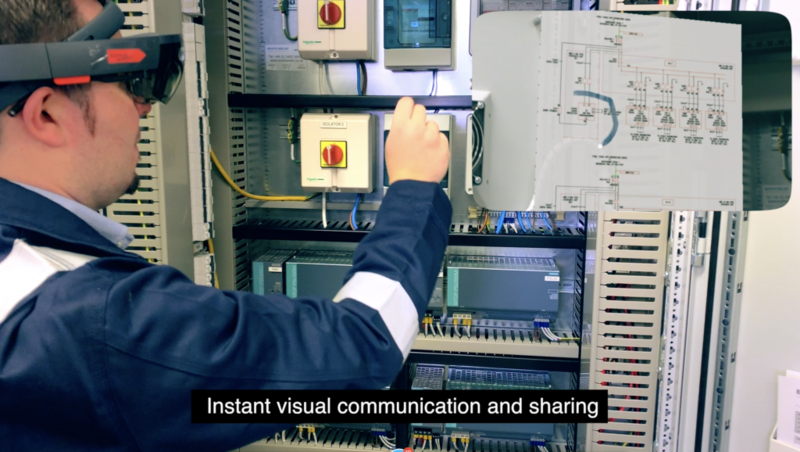 Video has the power to quickly demonstrate all the elements of this complex digital solution in just one shot. The first challenge of this project was the complexity of the product. The digitalisation solution was a complete integrated solution designed to streamline the running of a plant or production line. There were many elements to the solution, including hardware and software, that the marketing team and engineers wanted to communicate, but they were aware also that the video needed to be kept tight so as not to overwhelm the audience. We overcame this challenge by proposing a video series rather than simply one standalone video. We proposed to produce one two minute video to provide an overview of the digital solution using professional voiceover to highlight its key features, and using strong visuals of the product in action to demonstrate to the viewer some of the applications of the solution. On the same day we proposed to shoot a series of interviews with key staff members discussing the company’s values and history, their approach digitalisation in general, and the design of the product specifically. We would edit these interviews into a series of short social media clips to be shared online and to serve as a FAQ section on the company website. On top of this they would be a valuable resource for the marketing team to email directly to prospects and partners to help explain the product. Control systems engineer, Andy, is interviewed for the ‘Talking Heads’ video series to be shared on social media. The second challenge was the timescale. The client wanted the main video for use at a trade show in Abu Dhabi which they were attending in a matter of weeks. It was a short timescale considering the complexity of the product and the number of staff involved in scripting and filming the video. We specialise in fast turnaround video so were confident that we could deliver the project on time, on budget, and to a high standard. Good planning and communication is vital for bringing in a project in on time so, after the initial meeting, we responded quickly to the marketing team’s brief with a detailed proposal outlining all elements of the production including the treatment of the subject, the locations, and each step of the schedule from pre-production to the shoot to post-production. This allowed us to see quickly that our schedules aligned and to prioritise tasks for the staff at Booth Welsh to complete to let us gather the necessary extra footage, logos, and information for the script. On the day of any video shoot we pride ourselves in working quickly and efficiently while still maintaining very high standards of storytelling and production. Working with a small team we were able to move quickly between locations, interview multiple staff members while keeping the videos’ objectives at the forefront of our questioning, and capture a bank of quality footage showing the product in action. 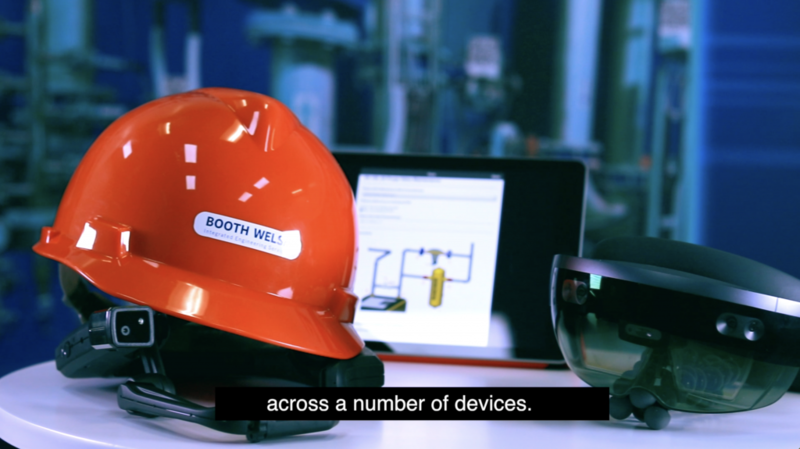 Combining footage shot on location and screen recordings from the VR headset allowed us to quickly demonstrate the remote support capabilities of this digital solution. A fast turnaround time for the rough edit was essential to allow space for feedback. We produced a rough edit for the Booth Welsh team which they had access to the day after the shoot. This flagged up a key changed they wanted to make which required a short reshoot. Due to our fast turnaround we had time to revisit their site and film the necessary footage before cutting the final edit. Our schedule still allowed time for the Booth Welsh team to meet again and view the final edit before the trade show. They made a few requests for changes at this stage including adding a closing graphic. Our efficient scheduling meant we were able to respond to these requests and the team were delighted with the outcome. The concept of producing one 2 minute overview video, backed up by a ‘talking head’ series of social media clips has been highly successful. A concept that would take an engineer hours to break down for the required audience, is now neatly summed up in a two minute video. The main video was used initially at the trade show and was well received. It helped the marketing team break down this complex product, show visually how the solution can be applied across a number of industries, and attract attention at a busy trade show through arresting visuals. The marketing team commented how helpful it was to have all the videos available to share via Vimeo links, meaning that following up on enquiries after the trade show was efficient and effective. The supporting video clips have been used to inform clients ready to find out more about the product, as well as being used by the marketing team to drip feed their social media feed. Distribution of this resource is now available to all staff within the organisation from engineers to marketing personnel. At the click of a button they can share the relevant video with prospects and partners opening up lines of communication and giving a powerful visual element to their discussions of this complex digital solution. Emma worked with us to design and produce our video for our new digitalisation product. It was tricky for us to put across exactly what we were looking for but Emma patiently worked with us to create those all important effects and impressive messaging that was needed. The project had a tight deadline but she just made it all work and even slotted in extra time to come in and do some extra filming. We were wowed and delighted with the final result. This lady can work magic with a camera for sure! I’d highly recommend getting in touch if you are looking to invest in video.